Don’t let its price tag fool you—this easy-to-handle telephoto zoom lens delivers excellent images, especially when used with a tripod. Covering a versatile 70-300mm focal length range (105-450mm equivalent on DX-format cameras), it’s an excellent choice for most daylight telephoto subjects, from portraiture to wildlife, on Nikon DSLRs that have a built-in focusing motor. Bring the action closer with vivid, lifelike detail. 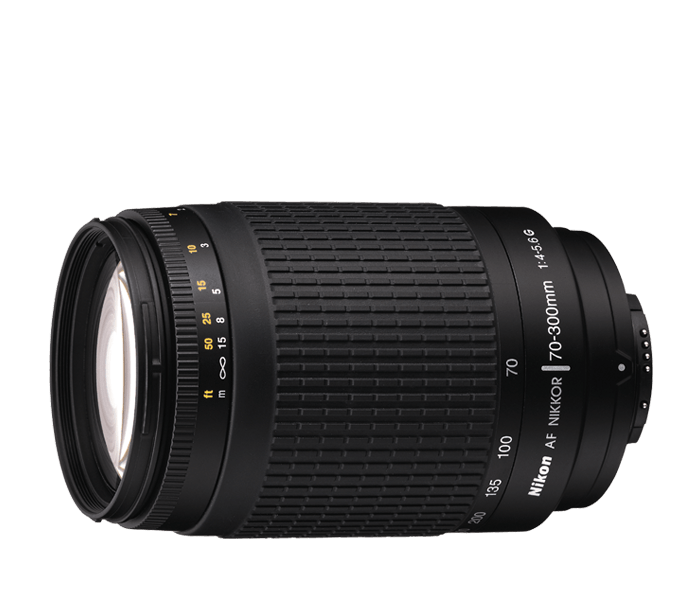 The AF Zoom-NIKKOR 70-300mm f/4-5.6G is a lightweight and versatile option for those seeking affordable telephoto zoom capability. With a 300mm maximum focal length (450mm equivalent on DX-format cameras) it brings even the most distant action closer. It’s an ideal lens for candids, travel and sports photography. The AF Zoom-NIKKOR 70-300mm f/4-5.6G’s D-type design provides precise distance and metering information to DSLRs that are fully compatible with the D-type design (see your camera’s specifications if you’re unsure). For DSLRs that are not fully compatible with the D-type design, some autofocus and metering functions may not be available.